Many people don’t realize that carpets, rugs and upholstery act as giant air filters for your home, trapping allergens and bacteria and keeping them out of the air we breathe. But just like any air filters, they need to be properly and regularly cleaned to remain optimally effective. All of us, and particularly the 1 in 5 American (roughly 60 million) who suffer from allergies or asthma, are greatly impacted by indoor air quality and the number of allergens and bacteria trapped in our homes that can trigger an attack. 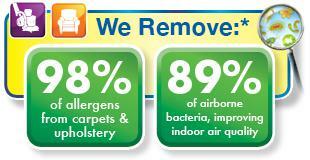 Considering that and the fact that we spend an average of 90% of our time indoors, selecting a trusted professional with safe and healthy processes to clean your carpet, upholstery, area rugs, tile & stone, and granite countertops is an important decision and plays a key role in the health of your home and your family. 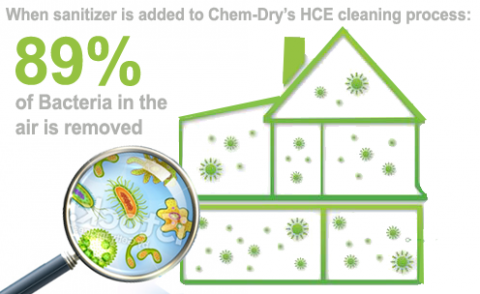 Indoor air quality is also a significant home health concern because the average home can harbor as much as 200,000 bacteria for every square inch of carpet. As the bacteria builds up, the bacteria lurking in your carpets get stirred up and circulates in the air your family is breathing unless you properly clean them. A Chem-Dry carpet cleaning is not only effective at removing the bacteria from the carpets, upholstery and other surfaces we clean, but it also improves the overall air quality in your home.